Utagawa Toyokuni I (1769-1825) Ichikawa Omezo I in the play Sukeroku Yukari no Edo Zakura, 1790's. Oban. Click here for a full-size image. Click here for a detailed enlargement. This is a rare and very beautiful theatre print - what else! - by Toyokuni I, the creator of the style of print that came to dominate nineteenth century art in Japan. Toyokuni was one of the great character draughtsmen of the ukiyo-e world. 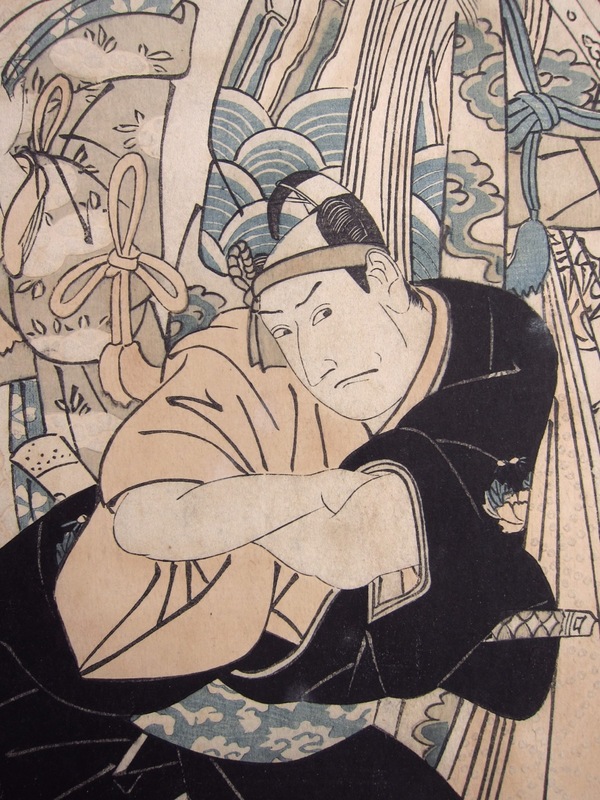 He established the look, the feel and above all else the character of the woodblock print. Like his European equivalent, Picasso, he was also astute at business and his great artistic charisma led him to achieve great things both as an artist and as an entrepreneur. This print comes from the end of his coveted, formative period of the late 1790's and early 1800's. Prints from this period normally lack the colour and subtlety that this fine piece retains. The play is one of the many farces that were written around loose extrapolations of the great Japanese revenge saga the Soga Monogatari. The courtesan Agemaki is the lover of Sukeroku (from the title of the kabuki drama) and also of the old samurai Ikyu. Sukeroku is in fact Soga Goro, the well known hero of the epic Soga Monogatari, in disguise. He is trying to discover the identity of his father's assassin and suspects the old man of possessing his father's sword. The play shows the verbal sparring between the two male leads as Sukeroku attempts to get the samurai to draw his weapon. There is a great deal of comedy in the play, Sukeroku being the classic archetype of the otokodate - the street-tough, romantic, reckless hero. Agemaki has to decide between the reckless young man or the certainty of her future with the aged warrior. In the final act, Sukeroku tricks the old man into drawing his sword, showing himself to be the killer of Sukeroku's father. Kunichika portrayed Agemaki in his very fine series 36 Good and Evil Beauties, and she is also portrayed by Kunisada in his finest series of portrait heads from 1860, Actor Portraits Past and Present. 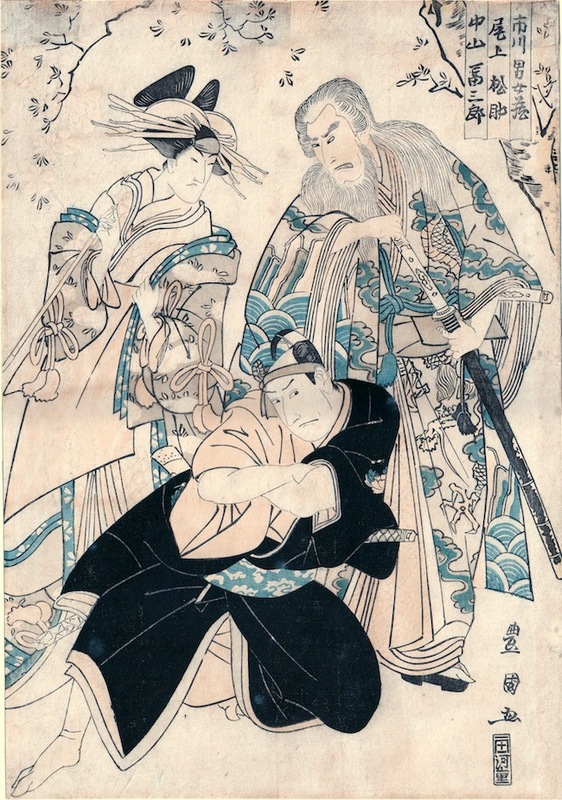 In this print, Toyokuni shows Sukeroku at the centre, kneeling, played by Ichikawa Omezo I. Behind him stands Onoe Baiko III in the role of the elderly samurai Ikyu, holding the fateful sword. Agemaki is on the left, played by the onnagata actor Nakayama Tomisaburo. The print is mounted on thick paper. The impression is fine with extensive gauffrage, blind printing of embossed flowers. The colour is excellent for a print of this age, if a little faded. The condition is good, there are some marks and scuffs and minor spotting but generally very good.